The 2016 Maritime Innovation Award from the Royal Institution of Naval Architects was awarded today to the patented energy saving and seakeeping device Hull Vane®, which uses a hydrofoil to reduce the resistance of relatively fast displacement ships. 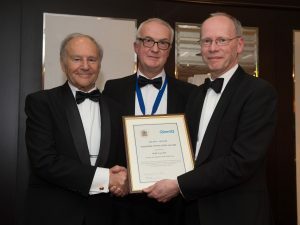 The inventor of the Hull Vane®, Peter van Oossanen, received the award from Ron Finlayson, Strategic Business Director of Qinetiq, during the Annual Dinner in London on the 27th of April 2017. The Maritime Innovation Award is presented by the Institution, in association with QinetiQ, to acknowledge outstanding scientific or technological research in the areas of hydrodynamics, propulsion, structures and material. The jury praised the Hull Vane® for its simplicity and effectiveness, and stated that solutions like the Hull Vane® are needed to reduce the CO2 footprint of shipping, while keeping shipping costs down in the face of rising fuel costs. The jury also pointed out the importance of improved seakeeping for offshore vessels, passenger ships, naval ships and superyachts. Pitching and yawing movements are reduced by the Hull Vane®, which increases the comfort onboard and operability of the vessel. The Hull Vane® is an excellent case study showing how a good idea, supported by subsidies in the development stage and protected by worldwide patents, can become a successful commercial product. The main markets for the Hull Vane® are superyachts, naval ships, coastguard vessels, ferries, RoRo vessels, (expedition) cruise ships and certain offshore vessels. Hull Vane BV is working on projects in all of these segments and has sold ten units to date, with many more in the development stage. The Hull Vane® is custom-designed for each ship and savings range from 5 to 20%, depending of the hull shape and speed of the ship. The Royal Institution of Naval Architects (RINA) is an international organisation, headquartered in London, which represents naval architects worldwide. The institution provides an essential role in the professional development by providing a broad platform of publications, training courses and international conferences.